TE Connectivity (TE) (NYSE: TEL) is a $14 billion global technology leader. Our connectivity and sensor solutions are essential in today’s increasingly connected world. We collaborate with engineers to transform their concepts into creations – redefining what’s possible using intelligent, efficient and high-performing TE products and solutions proven in harsh environments. Our 80,000 people, including 7,500 design engineers, partner with customers in over 150 countries across a wide range of industries – www.TE.com. Waldom Electronics is an authorized master distributor for TE Connectivity. Waldom sells exclusively to distributors; Waldom never sells to OEMs or to end-users. Expand Your Sales Opportunities! Crimp geometry is complicated. Selecting a TE Hand Tool engineered to exactly match the TE Terminal Specs SHOULDN’T HAVE TO BE! 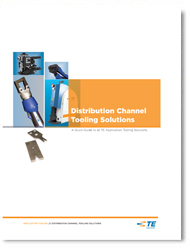 Download our Product Cross-Reference Guide to identify the right tool and make an associated sale! TE Connectivity continues to be a key supplier of innovative circuit protection solutions and a leader in PPTC resettable device technology to customers worldwide. TE Connectivity's extensive range of circuit protection products help prevent overcurrent and overvoltage faults, such as a short, power cross or surge, keeping your devices running longer. TE's circuit protection products are in compliance with globally recognized ISO9000/TS16949 standards. Product Types Include: Overtemperature, Overvoltage, Overcurrent and Hybrid Circuit Protection Products. Over 3,000 products in-stock! Applications Include: Portable electronics, Automotive, Industrial appliance, and Telecommunication markets. Available through Waldom, the portable, magnetic LightKnack is designed to provide light anywhere you need it. Attach it to hand tools, use it in engine compartments, or behind a computer...the possibilities are endless! Simply place the light on any ferromagnetic surface, point the light to where light is needed and turn on the switch. Product Features Include: High-intensity, long-life LED bulb, Small footprint, Rare earth magnets, Rugged design, Up to 8 hours of battery life, Replaceable CR12166 batteries, and Light angled toward work surface. Waldom Electronics stocks and provides immediate shipment on over 40,000 TE part numbers. Waldom’s inventory ranges from the most popular A and B part numbers, to less-frequently stocked C and D items. Waldom offers broken-pack quantities on the vast majority of TE part numbers at a small mark-up over distributor cost. 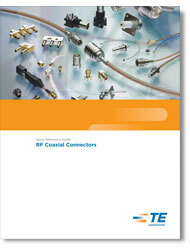 Please click here to view our TE Connectivity distributor cost book. Waldom Electronics stocks over 1,200 unique TE Application Tooling part numbers for immediate shipment. Waldom offers a minimum order quantity (MOQ) of one piece compared to TE Connectivity MOQs of 10 or 25 pieces. Waldom offers its distributor customers cost-plus pricing on all TE application tooling part numbers. Product Types Include: Certified Hand Tools, Hand Tools for SDE Die Setsr, Hand Tool Kits, Reel-Fed CERTI-LOK Hand Tools, and Insertion & Extractions Tools. Video Resources: Available in "Featured Videos"
Please click here to view the TE Connectivity Application Tooling Catalog. Please click here to read more about our TE Connectivity Application Tooling offering. Waldom Electronics stocks over 190 unique TE Switch part numbers for immediate shipment. Waldom offers a MOQ of 1 piece on all in-stock Switch part numbers and offers its distributor customers cost-plus pricing for the product line. TE has integrated these into one cohesive set of RF Coaxial products serving the automotive, broadband, medical, instrumentation, military/aerospace and wireless infrastructure markets. Product Types Include: Standard, Miniature, Subminiature, Microminiature,Contacts for Multiposition Connectors. Applications: Irrigation Management, Energy, Data Comm, Automatic Meter Reading, Unmanned Air Vehicles, Oil and Gas Monitoring Equipment, Security, Equipment and Cameras, DAS: Prism Host, Remote Access Unit, Expansion Hub; and Fleet management. Waldom Electronics stocks over 200 TE IDENTO labeling part numbers for immediate shipment. Waldom offers a MOQ of 1 piece on all in-stock TE IDENTO labeling part numbers. Waldom offers its distributor customers cost-plus pricing on the TE IDENTO labeling product line. Suppliers count on Waldom for a complete turn-key solution in the design, assembly, marketing and sale of engineering kits. Waldom and TE Connectivity have partnered to bring to market 250 unique engineering kits. Kit types include: design, solution, application and industry. All kits are in-stock and available for purchase from any TE Connectivity authorized distributor. © 2019 Waldom.com . All Rights Reserved.